On the campus at Oregon State University in Corvallis. The news about the latest price hikes at Oregon State University makes one wish for a radical innovation in higher education. This would be the creation of a bare-bones and no-frills system to educate and train all those interested, not just those who can afford it or are willing to indebt themselves for life. The OSU trustees on Thursday approved increases that put the price of undergraduate studies at $10,366 per year, meaning three terms of the 2016-17 school year. That includes tuition of $8,715 and mandatory fees of $1,651. It does not, of course, include living costs for a year. 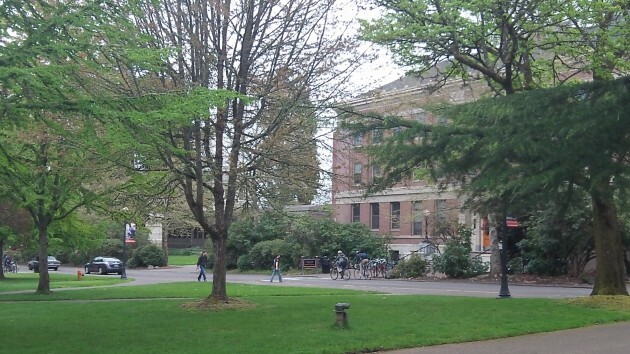 OSU says the University of Oregon will be even more expensive, though according to a report by the American Association of University Professors, for the current year the U of O costs slightly less. In any case, running a big university like those in Corvallis and Eugene no doubt is an expensive proposition. OSU reports annual revenues and expenses of more than $1 billion in fiscal 2015. Of that, enrollment fees made up $347 million. An analysis of comparable institutions done by AAUP in February showed that Oregon State had 38 administrators making more than $200,000 each. It had another 62 who were paid between $150,000 and $200,000 each. Compared to that, the average pay of a full professor was just under $115,000, according to the faculty group. The ranks of top-level administrators include the president, of course, whose presidential salary alone this year is $528,744, the executive vice president with just under $400,000, and the president’s chief assistant with $116,568. There’s also a vice president for university relations and marketing with $266,112; Another vice president of university relations and marketing makes $128,940. Various vice presidents, directors and associates make up the rest of the top administrative team. No doubt all these people do something important. My question is whether all of it is necessary so that thousands of young people can learn, as quickly as possible, what our country needs them to know in science, technology and the humanities. Point of order regarding “education” and “training”. I’ve done both in an industrial setting where failure likely meant discipline for an employee. Education tends to be strategic — aimed at identifying the tactics (and identifying new ones) which might meet a specific goal. During my time pursuing a BS degree, the homework, the tests, and much of the coursework gave me tools to solve specific issues. Looking back at the end, I knew how to think and to solve problems that hadn’t been presented yet. So, before throwing numbers around and making plans, lets take a breath and answer a question — what problem are we really trying to solve……………..
Gracious centrist, after your B.S are you going on for a P-iled H-igher & D-eeper certificate? It’s been my experience that those who think up ways to solve problems not yet thought of tend to miss the simple things. Like cutting those outrageous salaries of those academics! Stayed with the BS so I could keep my boots in the mud. More things to do and solve there. My favorite Profs in the late 60s were paid the equivalent of 9 months of what they could have made in industry. Work ethic was different in that era. This should, I think, be an editorial in the GT & DH. Lord knows I couldn’t have gotten my BA at a University (in California, in the 1970s) on my dishwasher salary. Well, that degree does exist, in that students can graduate with almost all degrees with 180 credits. If students take summer school as a part of their education for three years, this is only 15 credits per term (12 total quarters over 3 years). It will require going to school 12 months a year, there will be less time for them to have a job to pay for the education, and it will require discipline on the part of the student to not take any extra courses that might interest them, and of course, to not change their major, but it could most certainly be done in 3. How can a student find the time to fit in classes on “Science, technology and the humanities” when the courses on gender study, white privilege, and black history take up all their time?